This site was created to inform the general public about the discovery of a new physical phenomenon: the Pressure Gradient Elastic Wave (PGEW). Pressure Gradient Elastic Waves will allow using an unlimited source of energy, namely solar heat. We hope that the new type of heat pumps will enable us to convert the thermal energy of air and water (~20ºС) into high potential heat (~120ºС) and then into electricity. The project: “Highly efficient generation of heat pumps, operating on the basis of the physical phenomenon “Pressure Gradient Elastic Wave” funded in 2015 from the fund of research and development of Ministry of National Infrastructures, Energy and Water Resources of Israel. 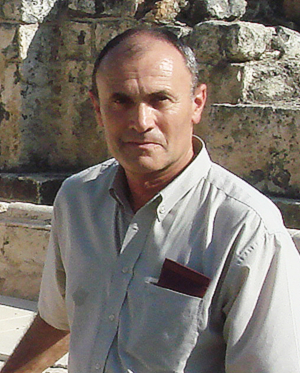 Dr. Beliavsky works for Super Fine Ltd. Israel. The company develops and manufactures Vortex Mills (patents). The Vortex Chamber is a main part of these devices. 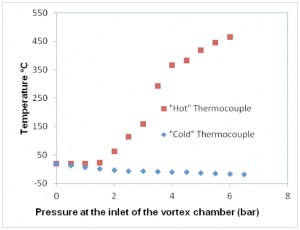 The effect was found unexpectedly in 2009 during tests with the Vortex Chamber. 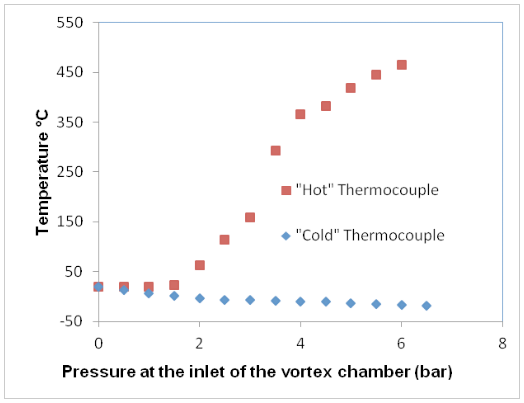 The experiments revealed the existence of temperature separation. The bottom of the branch pipe connected to the side wall of the chamber was heated to 465°C, while the temperature at the center was reduced to –45 °C (compressed air was feed into the chamber at room temperature ~20 ºC). This effect cannot be explained on the basis of previously existing theories. This circumstance prompted the author to investigate the physics of the phenomenon. Pressure Gradient Elastic Waves are a kind of elastic wave that actually exists in nature and exhibits itself in some devices, for example in Vortex Tubes (Ranque effect). The concept of PGEW is proposed and substantiated in articles (Article 1, Article 2). – Density fluctuations (powerful sound) must also be present inside the volume. The PGEW carries energy from the zone of low pressure towards the high pressure zone. This heat transfer uses the energy of the force field, which creates a pressure gradient. The energy transfer reveals itself in the cooling of the low pressure zone and in heating of the wall placed in the zone of high pressure. This heat transfer can take place without a temperature gradient – from the cold wall to the hot wall. The PGEW is a unique natural heat pump. What can PGEW give us? 1. A new class of refrigeration cycle devices will now be developed for cooling and heating (as in indoor air conditioners). The new devices can operate using any gas (including air), so we can abandon Freons, and they can operate in any temperature range. From preliminary estimates it can be reasonably assumed that these devices will be much more efficient than the existing ones. For example, an installation for the desalination of seawater operating by the direct evaporation principle will be set up. All thermal energy spent on seawater heating and evaporation is returned to the top of the cycle in this installation. All this will give significant energy savings. 2. The reduction of internal energy consumption will help to create efficient heat pumps, which will take heat at 50–70 °C and convert it to a temperature of 110–120 °C. This will allow us to obtain a significant amount of electricity using solar heat (sun-heated water). 3. It is hoped that further reduction of the internal energy consumption will increase the heat pump temperature range from ~20 °C to ~120 °C. These devices allow us to create a new power generation industry. Electricity will be generated by using the heat from seawater and from the surrounding air. Imagine ships whose propellers operate by obtaining heat energy from seawater! If you have any questions or want to send a message, contact us. If you would like to become an investor of the project, contact us please. All rights regarding the materials published on the website pge-wave.com are protected under the laws of Israel. When these materials are used a hyperlink to the website pge-wave.com is required. Reprinting of the materials published on this website, without agreement is prohibited.